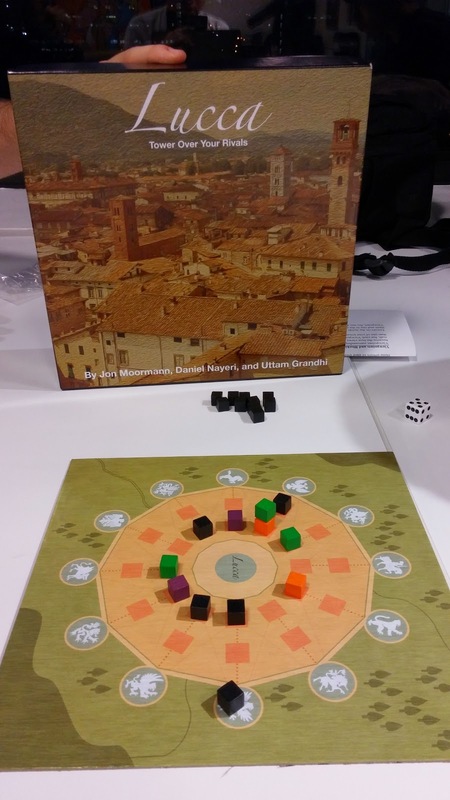 First game I got to try was Lucca, created by a fellow classmate who has won several awards at various indie festivals. It is currently self published and may perhaps appear in a future Kickstarter! 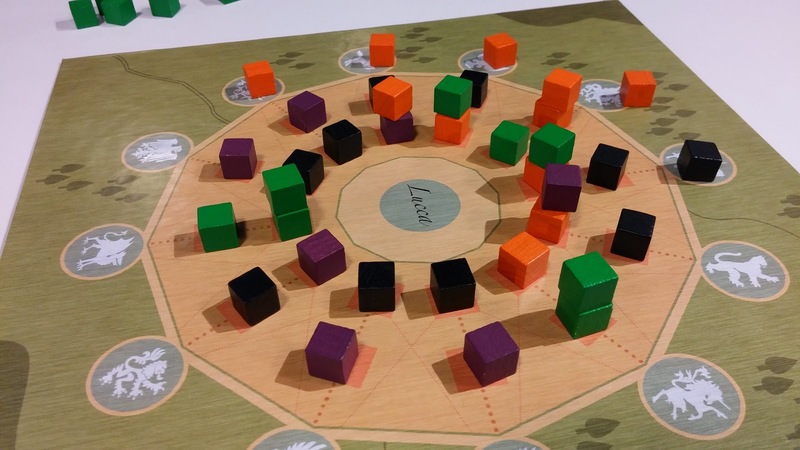 Lucca is an abstract 2-3 player game where players take turns placing their block onto the game board. During their turn, they will roll a die for the black neutral player and move the black cube that many spaces, clockwise around the board. A black cube will be placed along that axis if possible. Then the player will take their turn. Players may place up to 2 cubes anywhere on the board as long as its an empty space OR on another of their own cube. Players can also place 1 cube onto any of your opponents' cube or even the neutral player's. The game continues until all spaces have been occupied and then players count points to see who has won. Points are awarded by how many of the circular symbols which your cube has access to. For example, if your cube is nearer the smaller circle in the center, then you can possibly see 3 symbols. However if there are cubes in front of you (i.e. on the outer ring), then you maybe blocked. If the cubes on the outer ring are taller than you, you will also be blocked. Because everything is open information, you can really plan ahead where you are going to place and score the most points. The only random part will be the black neutral player's movement as it is determined by the die roll. You could also rush to finish the game if you know you are in the lead and unfortunately there is nothing your opponent can do to stop you. So making sure you are not far behind is important. It may play better with 2 than with 3 because it will be a head to head battle instead of ganging up on 1 poor soul. In summary, its abstract, quick and easy to learn. I will view this as a light filler and if they can make the board foldable and thus, shrink down the box size, it will be a good value. As is however, I think the production costs maybe a little bit too expensive for what it delivers. I will need to play a few more times to confirm my thoughts but as is, I think its a little too light for my tastes. Next up, Impulse with 6 players! 5 of them are newbies so I had some rules explanation to do. I think I did an ok job because most of them did not have many questions after that. I will not go through the rules again but elaborate more on the game play. The universe has no space for all of us! We started off mostly just exploring the area around us and doing the best we can with our cards. I tried not to make the same mistake again where I placed a powerful card in the Impulse just because I wanted to use it. The rest though rushed towards the sector core to score the easy points. I guess I did not have much of a plan and was just seeing what else I can try (i.e. refining or mining). Unfortunately though I did not have the right cards from my first draw. I realised then that the randomness of the card draw will probably determine your strategy from the get go. Even though we had 5 newbies, the player aid on the races card is quite helpful and there wasn't any hiccups. The problem I think will be getting the players to take their turn quickly and then keep the game flow going. This is especially highlighted when you have 6 players because while a turn maybe quite fast, say, 5 minutes, it will be almost 25 minutes before it comes back to your turn again which is a REALLY LONG TIME. In future I will not play with 6 again. I think this is more suited to 3-4 players. 2 players have been eliminated! Me included! 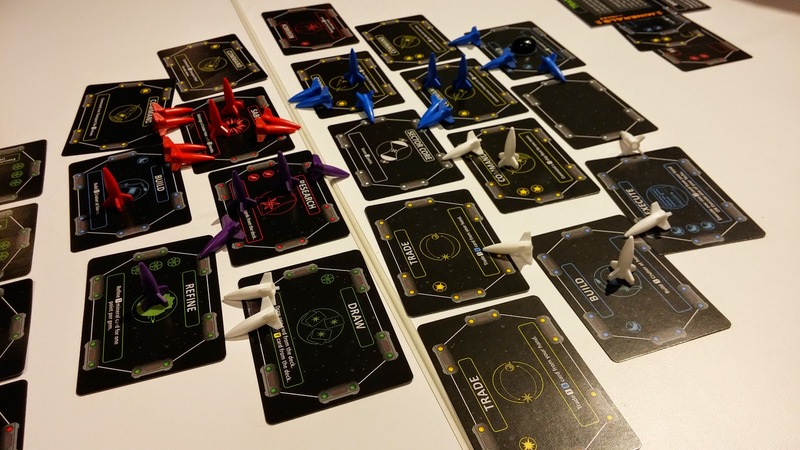 2 of the players immediately formed an alliance (Blue and White) and they started to move around the board, occupying a lot of sectors in near their home. Yellow player got really aggressive with a lot of cruisers and beating up on the Red player but due to some misunderstanding with the rules and movement of cruisers, left his transports behind as sitting ducks which the Blue player took advantage of. Subsequently, Yellow cruisers were sabotaged and in the end was the first to be eliminated. 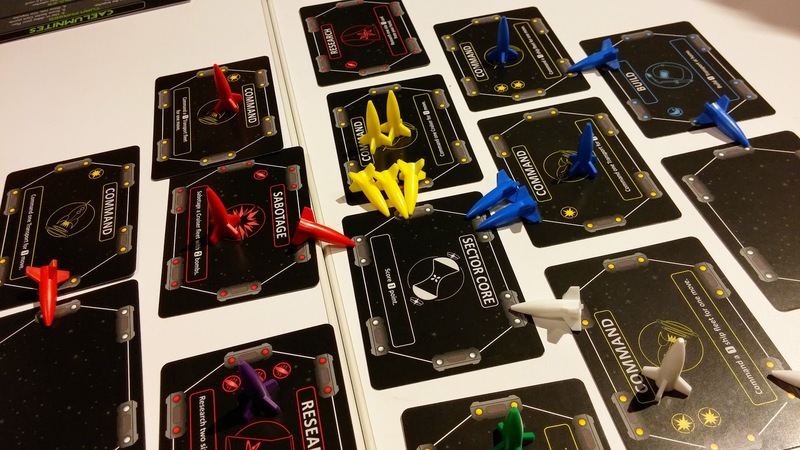 Red managed to rebuild his ships, deterring Blue from going in further. Purple player initially felt ganged up on because Red and Green (me) went in to pincer him. So he was relatively quiet throughout the game but had managed to have a lot of minerals and a good Plan going. The rest did not really pay attention, or if they did, I am guessing we were too concentrated on our own things to realise. Also, the Blue and White players were very close to 20 points. At this time, I was already eliminated by the White player given that I did not have much of a cruiser fleet to defend myself. Purple however, given so much time to build up, managed to sneak in a win when he refined all his minerals to come from behind and win the game! It was quite epic because no one realised his minerals until its too late and by then they could not move fast enough to wipe him out to prevent his win. I am still not convinced about the hype for the game. The luck of the draw can really screw up your plans. Speaking of which, all of us did not do much Plan action until near the end where Purple had 2 cards in his Plan to activate. Not sure why but for me it felt as if I did not see a lot of Plan cards. It does prove to me that the 2 paths to victory are viable and I see now the importance of having minerals to boost the effects. I think for now though I still prefer Innovation because of the symbols and the card shifting are quite unique and interesting. Impulse kinda feels a little too simple right now. All players felt it was a good game and enjoyed it but do agree that it is too long. I think we took almost 2 hours to play 6 players. For me, its still a TRY BEFORE YOU BUY. WoW ....... you get to play while studying! yup! :D i can now say " i need to play this and that for homework! :P"